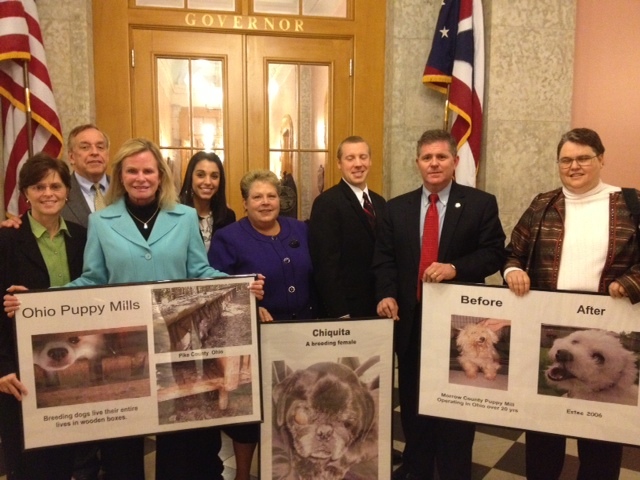 many others for 7 years for a law that would bring oversight to high volume breeders in Ohio. Senator Hughes worked through 3 general sessions and countless interested party concerns. Sorting through fact and fiction and extremists from both sides of the issue, Senator Hughes, Chairman Dave Hall and Chairman Cliff Hite were instrumental in coordinating rescue groups, high volume breeders, hobby breeders, veterinarians, county representatives and others, to create language with which all parties are comfortable. Senator Hughes is a champion for dogs and we are deeply appreciative of his dedicated effort to see this bill pass. As many have said, when the interested parties are not able to include everything they want in a bill, you likely have a middle ground, which means a bill can get passed by both the House & Senate. Of course we hoped for standards of care to be in place in the bill. We trust that the Advisory Board will have an impact on the daily living conditions of the dogs by working with the Director of Agriculture as this is one of the important reasons for the writing of this bill. Of the very few “no” votes the bill received, Senator Faber was the only “no” vote during concurrence in the Senate as he liked the original Senate version without fees to the high volume breeders. Of the 96 House votes, the 5 “no” votes were Representatives Buchy, Amstutz, Goodwin, Martin, J Adams. We thank every Senator and House Member who voted yes to help Ohio’s dogs. Representatives Fedor, C Hagan, Phillips and Okey were an excellent voice for us in the House Agriculture Committee. We also thank Representative R Hagan and former Senator Cates for their contributions. There are countless people to thank for their contribution to bringing this bill to the Governor’s desk. Chief among them is our volunteer lobbyist, Penny Tipps of Public Policy Strategies. Penny has been involved from the beginning and has donated untold hours working for the dogs. Penny’s experience and knowledge were instrumental in keeping the puppy mill bill alive until we could get it passed. Sue Pohler, of Pohler and Associates, has been our volunteer attorney and worked tirelessly in honor of her puppy mill dog Julie. Sue provided invaluable governmental expertise and knowledge of the Ohio legal landscape. We were fortunate to have another skilled attorney in Melanie Cornelius. Melanie was instrumental in the original draft of the bill and spent mountains of time on research and writing. The Columbus Dispatch and reporter Jim Siegel has been a friend to our cause by keeping everyone aware of the current state of the bill. We are thankful to the Dispatch for caring about Ohio’s dogs. While Ohio has suffered a black eye for our puppy mill reputation, we have the most amazing rescue groups who give their all to help dogs in need. I am in debt to Martha Leary of Star Mar Rescue, who is the most knowledgeable high volume dog kennel advocate in Ohio. Martha’s expertise about what goes on in the kennels is unmatched. Tremendous thanks to Karen Minton of HSUS. Karen’s depth of knowledge of animal law and Ohio legislation is unparalleled. Karen has also created bridges in Ohio that likely have never existed between humane advocates and those agencies that may have seemingly been our opponents. Thanks to Karen, this gap is narrowing and all animals will benefit because of her supreme ability to collaborate, educate and be the voice we need in Ohio. We must thank Carrie Mavrikis, aide to Senator Hughes, Andy Bowsher, former aide to Senator Hughes, Ali Mock, aide to Senator Hite and Mike Sabo, aide to Chairman Hall for their over-the-top attention to detail and persistence with the deluge of information they handled during 2012. There have been so many rescue, shelter, humane society, dog wardens, police officers, prosecutors, citizens, veterinarians, dog breeding professionals and government employees that have assisted along the way. These people and organizations have testified or assisted with support. Dale Bartlett & Tom Pappas-The HSUS, Vicki Deisner & Cori Menkin The ASPCA, Dr Sue Wilcox-Steel Valley Spay/Neuter Clinic, Jack Price-Perry Co Humane Agent, Annelle Mullet-Holmes Co HS, Janet Weitzel-Janca-Bald Is Beautiful Rescue, Rob Junk-Pike Co Prosecutor, Kristina Lang-Marilyn’s Voice Rescue, Joe Rock-Franklin Co Dog Warden, Erin Michelli-Ohio Fuzzy Pawz Rescue, Andy Riggle, Dawn Smitley-Coshocton Co Humane Agent, Bob Baker-Missouri Alliance for Animal Legislation, Washington Co Deputy Keelan McLeish, Katie Davis, Michelle Gatchell, Janice Kobi-Fairfield Co Cares, Debi Ketterer, Matt Granito-Ohio Dog Warden Assn President, Allison Halloway-Pawsavers, Barby Roberts-Westie Rescue, Ren Nichols-All Tails R Waggin Rescue, Zaron Van Meter-Scottie Rescue, Sandy Shelley-HS of Richland Co, Barbara McKelvey-Small Paws Rescue, Cathy Cowen, Veronica Dickey-Peace For Pets, Cheryl Rakich-Almost Home Dog Rescue, Linda Stickney, Deborah Rowe, Dr Beth Logan, Dr Emily Fagundo, Gary & Judy Barnhart, Joyce & Bill Hague. Sara Tobin , Heather Luedecke-IGCA N OH Rescue, Julie Bertani-Ohio Pet Plates, Lisa Abele-HS of Jackson Co OH, Annelle Mullet, Chris Tanis-A Puurfect Start, Robin Craft-Black and Orange Cat Foundation, Jessica Baker-H S of Jackson Co, Circle Area H S, Cathy L. Rice-Ohio Basset Hound Rescue, Lynna Aronson-STOP, Mag Wright, Peggy Kaplan-Ohio Pet Plates, Becki Kelso-Kind Hands for Paws, Susan L. Montgomery, Meg Long-Pets Without Parents, Mirna Bowman-Columbus Dog Connection, Mona McGinnis-Colony Cats & Dogs Rescue, Dawn Allen-Ohio Fuzzy Pawz Rescue, Susan Dykstra, Jason Kindred, The OVMA, Jeni Rooney-Cavalier Rescue, Rosalie Hoover, Lisa Dudley Pitties Place, Theresa Landon-Ohio SPCA. And to the countless others who contacted their legislators when called upon. This has been a tremendous team effort that has brought a camaraderie among rescues to a higher level and a newer, better understanding to animal issues and the agencies in Ohio that oversee them. It’s a great day for Ohio’s dogs ! of breeding dogs living in high volume breeding facilities.